Chicago filed suit Wednesday against U.S. Steel following two spills last year that dumped more than 300 pounds of highly toxic hexavalent chromium into a tributary of Lake Michigan, which provides drinking water for Chicago and more than 5 million Illinois residents. The move comes one week after attorneys at the University of Chicago’s Abrams Environmental Law Clinic filed their own lawsuit against the steel corporation on behalf of the Chicago chapter of Surfrider, a nonprofit that advocates for water quality improvements for Great Lakes surfers. Both the city and Surfrider sent the company notices of their intent to sue in November. “This Great Lake is our most precious natural resource and we must preserve and protect it, while taking steps to punish those who pollute it,” Mayor Rahm Emanuel said in a statement Wednesday. The city lawsuit asks for injunctive relief and civil penalties against U.S. Steel for repeated violations of the Clean Water Act at its steel mill in Portage, Indiana. According to the city and Surfrider, the violations date to 2011 and include the two spills last year of hexavalent chromium, a toxic heavy metal used in a number of industrial processes that can cause cancer in humans when they are exposed to it through breathing, according to the Environmental Protection Agency. The chemical, made famous in the 2000 film “Erin Brockovich,” is used in steelmaking, corrosion prevention, as a wood preservative and as a pigment in dyes, paints and inks, according to the EPA. After Surfrider filed suit last week, U.S. Steel listed steps the company has taken to improve its Portage facility, such as installing a new wastewater pipe system. "We are reviewing the complaint," the spokesperson wrote via email. "We have worked cooperatively with government and regulatory entities to swiftly correct the issues at our Midwest Plant in Portage, Indiana. We believe that protecting our water resources is of critical importance and have taken multiple steps to improve our environmental performance company-wide." Note: This story has been updated to include a statement from U.S. Steel. Jan. 17: An environmental nonprofit represented by University of Chicago lawyers filed a suit Wednesday against U.S. Steel over Lake Michigan pollution. Dec. 12: Surfer environmentalists and the University of Chicago intend to sue U.S. Steel over toxic Lake Michigan spills after it twice released more than the allowable quantity of a cancer-causing chemical into the waters this year. 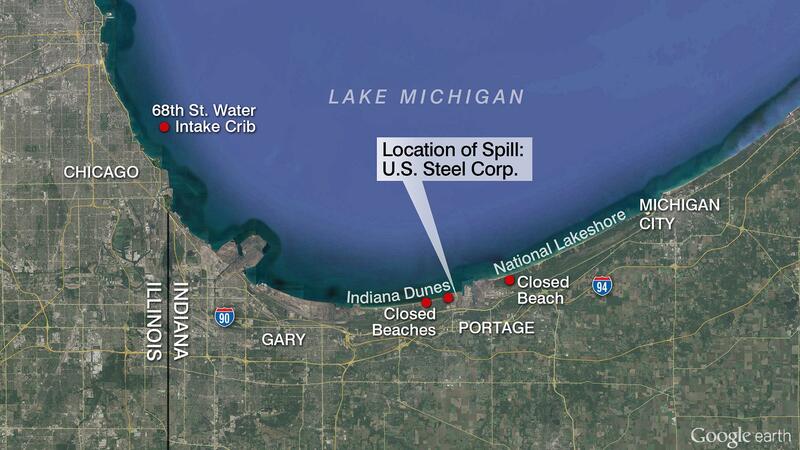 Nov. 20: Records related to an April spill of a toxic metal into a Lake Michigan tributary have not been given to Chicago. The city is now threatening to sue U.S. Steel.